On February 17 and 18 was held the annual Civil Security and Fire Protection Conference at the Quebec city Convention Centre. The event was sponsored this year by the ASCQ (Association de Securite Civile du Quebec), MIARC and RECO-Quebec. Several speakers, partners and exhibitors were present to share their expertise, including Viking Fire Protection, represented by Pierre Noël (Notifier Distribution Manager / Montreal), Pierre Beaulieu (Fire Alarm Manager / Quebec), Yannick Leclerc (Fire Alarm Sales Representative / Quebec) and Tony Lapolla of Notifier® by Honeywell (Regional Sales Manager - Eastern Canada). VIKING is a distributor of NOTIFIER® by Honeywell International products in Quebec, British Columbia, Nova Scotia and Ottawa (Ontario). 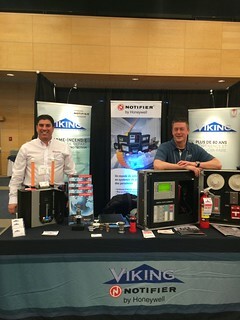 From left to right, Tony Lapolla (Notifier by Honeywell) and Yannick Leclerc (Viking Fire Protection).